Often I forget that there are uniforms that do border on the obscure. I’ve been in court recently (I took a Monopoly board in with me and gave out Community Chest cards) and was quite surprised to see robes, neckties and wigs used as part of the proceedings by the officers of the court. My previous experience of court has unfortunately been a steady diet of LA Law starring Corben Bernsen (who once swapped a part in his film with the red paperclip guy). All the lawyers wore cheap shiny suits and the only robe was on the judge. What I found slightly more distressing here is that no hats are allowed without the permission of the Judge! Really? But you wear a wig! A practice that is reflected in it’s tradition, it’s still a little unnerving to talk to a man in a wig who is taking the wearing of the wig very very seriously. At our recent Hats and Wigs party I remember being told by a young skinhead that the headwear made people feel invisible; either it was ignored or they were. 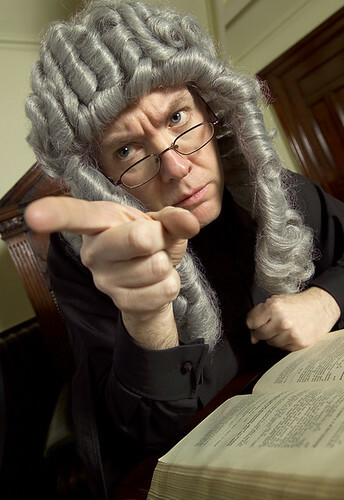 In court you don’t ignore the wig, you have to accept that it’s part of their uniform. I can’t think of any other profession that requires a wig for it’s daily grind (except for strippers in some parts of the USA who have to wear a mirkin to avoid indecency laws) – can you?